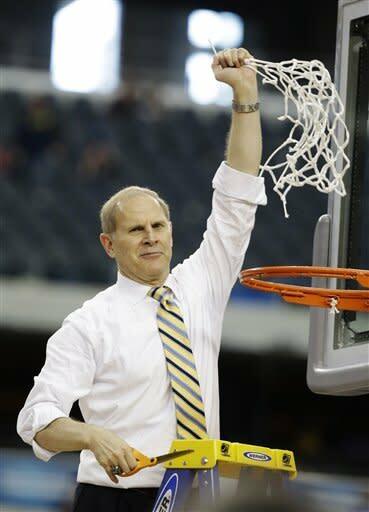 ARLINGTON, Texas – John Beilein was climbing a ladder to go clip a net, climbing a ladder to the Final Four, making a climb a long, long time coming. Off to the side, surrounded by kids and grandkids, Kathleen Beilein looked up and began dabbing her eyes. Thirty-five years as a head coach, so many of them grinding it out in little schools in western and central New York, so far from the glamor of this – the middle of Jerry Jones' billion-dollar football palace – that it's a stretch to call it the same sport. Michigan 79, Florida 59, and, yes, the Beileins weren't at Erie Community College in Buffalo anymore. "It's almost like a dream come true," Kathleen said. "I am almost speechless." 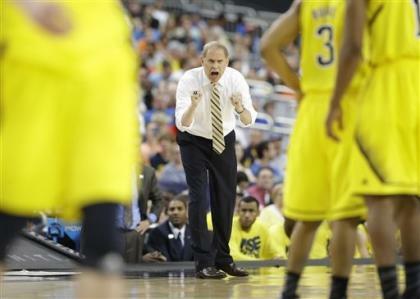 John Beilein is a lifer, a grinder, a no-frills basketball teacher. He's a coach's coach and a good man's good man. He grew up the eighth of nine kids in little Burt, N.Y., near Niagara Falls, the son of a mill worker and an apple farmer, the nephew of basketball coaches. There are no frills to him. He has no airs to put on, nothing but a guy who loved to coach the game and was pushed slowly, yet inevitably, up the various stratospheres of the game because of his ability, not his self-promotion. Erie CC for four seasons, Nazareth for one, Le Moyne for nine, Canisius for five, Richmond for five, West Virginia for five and finally here in his sixth season at Michigan. He's won 671 games overall and is the only active coach to win at least 20 games in a season at junior college, NAIA, Division II and Division I. He didn't reach a high major conference until he was nearly 50. Now at 60, the pinnacle is reached. "You know it's never been about that, believe it or not," Beilein said. "It's always been about what we have here, [motioning to his players]. There are a lot of people who are part of it, [though]. A lot of people who helped a nomadic coach who has always been looking for an opportunity to do something like this. "If we had never went [to a Final Four], it wouldn't have been like, 'Oh, I missed out on something.' But the fact we are going is great, the frosting on the cake." For a coach, this was a frosting kind of performance, the Wolverines delivering a near-perfect game – strategy, execution and hustle. They blitzed Florida early (13-0 to start), dominated throughout (up 25 at one point) and rode an absolute landslide delivering them to a regional championship. It was a day decades in the making, all those years figuring out how to make teams tick, sometimes with good talent, sometimes with lesser, sometimes with big men, sometimes with all guards. Often with almost no one watching at all. Through the years, the one constant has been Beilein. Even when West Virginia and Michigan allowed him the chance to coach elite talent such as Trey Burke and Mitch McGary, he remained the same. Now paid about $1.7 million annually, in charge of a large Big Ten operation, he's still the one who cuts up the game and practice film. That's how he did it at Erie, that's how he's still doing it. "We're talking about every practice, plus games," said assistant Bacari Alexander. "He cuts it personally. He's an old football coach from his high school teaching days, reel to reel." For Beilein, there is a value in the process, not just the result. The journey of coaching all those teams, of meeting and leading all those kids, is what he values. As he said, he has always been in this to win it, but the promised land wasn't the only goal. Besides, cutting film isn't so odd. The guy still cuts his own lawn, with a humble mower, 40 minutes, back and forth making sure the lines are precise. "Yes, he mows his own lawn on a push mower," said son Patrick, who played for his dad at West Virginia, assisted him at Michigan and is now in the family business as the head coach at West Virginia Wesleyan. Well, John cuts it, unless Patrick or one of his brothers is home to do it. The coach is still there to monitor the process, of course. "He'll say, 'Patrick, look at how your lines are,' " the son laughed. "That's just how he was raised. He was taught to do things by himself." Beilein coaches in a shirt and tie, with the sleeves rolled up, not an Armani. He spends a considerable amount of time calmly sitting on the bench – or here on a stool – and not jumping around like a lunatic, screaming at his players. He doesn't try to act young so his guys will listen. He instead commands their respect, they say, with his obvious intelligence, acumen and decency. No one wants to disappoint him. "No way," laughed Tim Hardaway Jr. They might not all know his backstory or understand the lessons he learned on those bus rides through snowstorms home from Saint Anselm or Niagara County CC or someplace they've never heard about. They realize the wisdom he imparts, however. They never question the strategy. "There is a humility about John Beilein that is something to be admired," Alexander said. "He is just a guy who really benefitted from sweat equity. He is a guy who has coached at every level and, regardless of the roster he had, he maximized it. Every stop. Here at Michigan, it's just more of the same. "I wouldn't say one for the good guys," Alexander continued, mindful that Michigan beat some good guys on Sunday. "I'd say this is one for the traditionalists." For Kathleen Beilein, that was part of where the tears came from. She watched her husband of 33 years work and work, coach and coach, always for the joy of the job, for the satisfaction of getting college kids to be their best. For so long, it wasn't about financial rewards, fame or glorious climbs up a ladder on CBS. Even far removed from the spotlight, she always believed he was as good as anyone. "I think this is part of our journey," she said. "We just didn't know when we'd get there, but we knew we'd get there." At that moment John Beilein's players were trying to hang the freshly clipped net around him, a nylon necklace 3½ decades in the making. He laughed and kept shaking his head and pushing it away. That stuff is for them, he was saying. This stuff was always for them. • Is Syracuse zone the best in the history of the program?